The F&B team at Amara Singapore has recently relaunch ELEMENT, their restaurant – bar concept. Element offers first of its kind, multi-cultural, multi-generational and multi-occasion F&B experience. 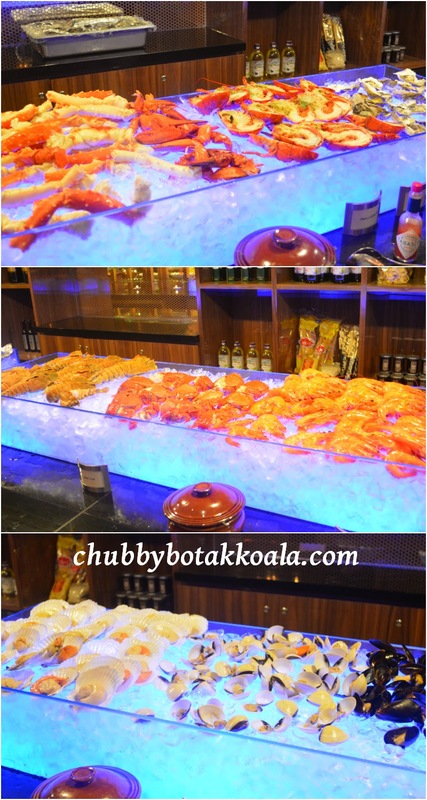 In this review, Chubby Botak Koala & Little Devil will only focus on the International buffet selections. The following are the selections available once you enter Element, Sushi & Sashimi counter, Bread counter, cold cuts and cheese (Woohooo, prosciutto with rock melon), Seafood (including lobster, crayfish, oyster, legs of Alaskan King crab, prawns, etc), live stations , roast selection, cooked food station and desserts. So let's dissect the buffet range starting from the sushi and sashimi selection. In sashimi section you have the salmon, tuna, seabass for standard selection. These cuts are fresh, generous and delicious. It seems that the chef like me, and I get some cuts of salmon belly which was fatty & beautiful. The sushi variety are ever changing depending to the fresh cuts they have and the creativity of the chef. For the bread, cold cuts and cheese, we zoom in on our favourite prosciutto with rock melon. We skipped the bread as we don't want to fill ourselves, however my MIL who had a bite of it said that it was good. In the background you can see there were showing Jamón ibérico ham. Unfortunately, it is only for ala-carte menu instead of the buffet. Moving to the seafood section, we devour the beautiful fresh lobster, crayfish, oyster and leg of Alaskan King crabs. The taste of the seafood are combination of freshness and well executed cooking technique before it was chilled. The lobster and crayfish are solid and I did not taste any fishy smell. The oyster size are medium in size, however the quality is superb. On the night, the live stations presented curry crayfish with fried mantou, Lap Mei Fan (sausage rice), ramen and tiger prawn tempura. The crayfish are bouncy and the mantou soak up the curry nicely. Lap Mei Fan (Sausage rice) is a good carbo option, where the rice are fragrant with tasty blood sausage and pork sausage slices. The ramen has springy texture while the broth was milky, robust but slightly peppery. We did not taste the tiger prawn tempura though. The cooked food selection is quite limited about 6 dishes, However, the focus in Element is about quality not quantity. Most of the dishes are good, with lyonnaise potato, lamb navirin and Taiwan cabbage are our pick for the cook food. While we have stuffed ourself silly with the seafood and sashimi, we only have little space for desserts, which included assorted fruits, chocolate fountain with marshmallows, assorted pastries, cold deserts and asian desserts. Luckily, we made the right decision focusing on the seafood and mains, as the desserts are quite ordinary. The atmosphere of this place is very good and very open. We were seated near the bar section, which has an opening towards outdoor seating facing Tras street. The open air bar concept is good, but it does make you wonder if it is wasting the electricity and air conditioner. Meanwhile, the floor to ceiling wine chiller will sure catch your eyes. It works in multiple way, as wine chiller, partition and decoration. Service is good when clearing the plate, however the staff knowledge need to be improve. When I ask them where the hidden ham come from, it took them ages to provide me with the answer. Overall, the newly launch International buffet selections are a definite winner. The seafood are fresh, they have a wide variety of selections and the quality of the food are excellent. From the price point, it is value for money. Cheers!! Please note that we visited Element in January 2014, so the Elements are still in Christmas atmosphere.